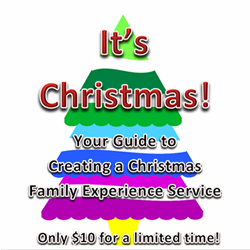 About the Children's Department: It's Christmas; a Christmas Family Experience - I'm Giving One Away! It's Christmas; a Christmas Family Experience - I'm Giving One Away! While your thoughts may be turning towards the many blessings God has lavished on you (and He does lavish many, many blessings, big and small on us all the time) and you may be starting to plan your Thanksgiving dinner with your family and/or friends, Christmas is really just two months from today. If you are looking for a resource which you can use in your ministry to help families celebrate on Christmas Eve; take a look at this Family Christmas Experience from NextGen4Christ . . . and stay tuned after the review, because I'm giving one away! It is extremely affordable; only $10! Resource includes - Game Ideas and instructions, Skit Scripts, Ideas for Music and worship and Tips for making a great atmosphere for families! Easy to "pull off" as you invite people to do what they already enjoy; join the Worship Team, The Game Team, or the Drama Team! NextGen4Christ has this to say about their Family Christmas Experience; "You are not trying to recreate a tradition in this program. Your goal is for families to gain a meaningful message out of an exciting program which is meant to encourage them as a family to seek God. Children make important connections when their parents, leaders, and peers all say the same thing! A parent singing the music their children love at church can show a child their parents care about their relationship with God. But most importantly, children remember Christmas because of fun times with family. We hope with this family experience, they’ll have so much fun with family they’ll remember Christ!" Easy to plan, prepare and present, this is a family experience the whole family can and will enjoy - and learn from - together! I'm very happy to say, NextGen4Christ is making one of these available for me to give away on November 10, 2014! If you would like to be in the drawing for It's Christmas; a Christmas Family Experience, please comment below to let me know your favorite Christmas song . . . for me it has to be Silent Night - I know an definite "oldie", but "goodie"! You will receive additional entries if you comment below to let me know if you have followed on Google Friend Connect, followed by liking on facebook with the tab in the "Find us on Facebook" box ON THE BLOG or at this link (not just liking the post) and/or have followed About the Children's Department by email. For each of these which you do you will receive one entry. In addition, if you "share" this post, you'll receive an additional entry (please let me know if you share). This will help me be able to draw names from among people who would like to win It's Christmas; a Christmas Family Experience and it gives you several ways to enter the give-away! Thank you for reading About the Children's Department and for sharing it with the people you know! I follow on Facebook, Ms. Lynda, and tweeted on Twitter. MY favorite Christmas song is Everyday Christmas, not a common one, but a good one, and one I know by heart.